Many people suffering from plantar fasciitis will develop knee pain shortly after the their first symptoms of heel pain begin. The reason for this is very simple. When our foot is injured we tend to favor it to help reduce the pain. When favoring the injured foot you are actually changing your biomechanics and putting greater stress on other parts of the body. 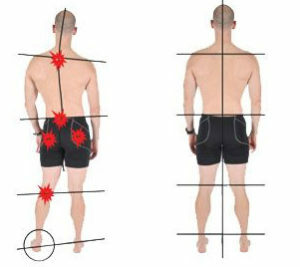 The body is now out of alignment and the knees will receive most of misalignment. This causes stress and strain on your legs. This will usually result in ankle or knee pain. The proper way to counteract this is correct the position of the foot. This can be achieved by wearing supportive shoes and the proper orthotic. Our Ultimate Heel and Arch Support was designed specifically to cure Plantar Fasciitis. You can read the detail here. I the past I have seen people experience side effects from Plantar Fasciitis that effects the hips, back and even shoulders. The lesson here is – take care the initial problem before it creates additional aches and pains.